Local government’s seat in the Šalčininkai District Municipality held an electoral conference of the Šalčininkai’s department of the AWPL. Eurodeputy and president of the AWPL, Waldemar Tomaszewski highlighted during the conference that the Electoral Action is the only Lithuanian political party that experienced a growth in support. AWPL’s leader assessed the current political situation in the Šalčininkai region and expressed his contentment with the outcome of the last municipal elections. The first direct, municipal elections, which were held in March 2015, went down in history of the Šalčininkai district. Its current mayor Zdzisław Palewicz, an AWPL’s candidate, managed to gather 77,55% of all votes, setting a country-wide record. In comparison to the municipal council elections from 2011, the ones from 2015 were also more favorable for the „Waldemar Tomaszewski Coalition“ – its support rose from 70% to 77%. According to Tomaszewski, his group was forced to swim upstream in the recent years, and any loss of focus may cause it to drown. 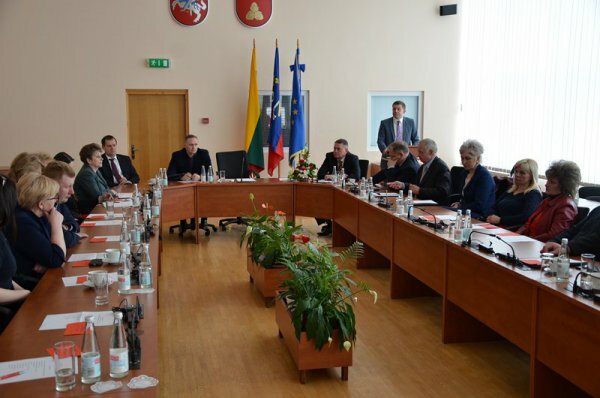 The leader of the Šalčininkai district’s department of the AWPL, Leonard Talmont, noted that there are many examples of activity in the region that people may take pride in. „We have gathered here today in order to assess and sum up our activity. This is the time to give our thanks for the previous work, and the time to unite before the next battle – the Seimas elections that will be held on the 9th of October. Our offer is fair for the voter because it is established on the values of honesty and meticulosity. We always keep our word and are concerned for the common people of our country“, said Talmont. The local leader of the AWPL has presented a detailed and exhausting analysis of the work done in the past 4 years – since the last electoral conference. Mayor of the Šalčininkai district, Zdzisław Palewicz, highlighted that the present state of the group is not the most crucial thing. According to him, having a vision for the future is of equal importance. „We should think about where we are, what are we doing and what we will be doing“, said Palewicz. After the reports were announced, the elections for the leadership posts inside the group were announced and held. Zdzisław Palewicz was announced as the new Šalčininkai district’s department of the AWPL leader. He was proposed for this post by the previous leader, Leonard Talmont, who led the department for 16 years. New leader, Zdzisław Palewicz thanked all those gathered for the confidence that they have put in him. He also announced that despite being in good health and having a strong position, the department needs further amplifications. Palewicz announced that he will take necessary actions toward reaching this goal. Leonard Talmont became the department’s vice president, while Józef Rybak gained the post of the department’s chancellor. Danita Jusiel was once more voted to be the department’s treasurer. Participants of the proceedings have also voted to choose the presidium, that was established in form of the president and vice president of the department, presidents of circles, treasurer and chairmen of the party’ main administration. What is more, department’s revision commission was also created. Earlier, two of the department circles, held their own electoral meetings. Waldemar Tomaszewski and Zdzisław Palewicz took part in both of them. Elections for the presidential post and activity reports were also taking place during those meetings. The biggest circles of the department are the ones in Soleczniki, Ejszyszki and Biała Waca.